The ShaderX7 book in particular offers a well-explained detailed approach to the problem. Before I continue, I’d like to extend my gratitude to Louis Bavoil for taking the time to review this article and giving some insightful tips on how to improve the shader. 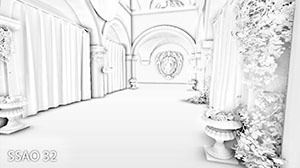 Roughly, HBAO works by raymarching the depth buffer, and doing this in a number of equiangular directions across a circle in screen-space. For the derivations, all points and vectors are expressed in spherical coordinates relative to the eye space basis. 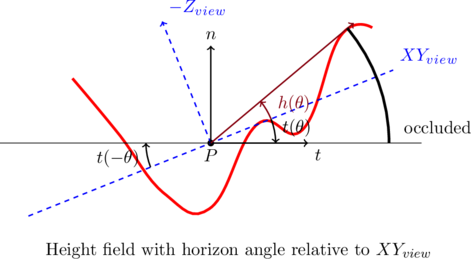 The azimuth angle rotates about the negated eye space Z-axis and the elevation angle is relative to the XY plane. This is a bit different to the common way of defining the polar angle, which is usually relative to the main axis, but the approach serves us well. The elevation angle is the only angle that will be of much interest to us, since the azimuthal integration will be handled entirely by marching in the different directions. 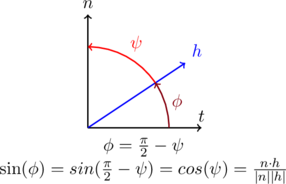 With each raymarch step, the line between the sample point and the centre point is considered. 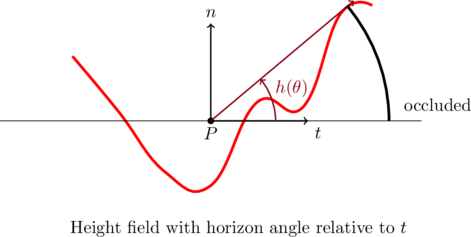 Each time the elevation angle is larger than the previous maximum, a new chunk of occluding geometry has been found. We add in the occlusion for the arc-segment between the last two found horizon vectors and weigh it with a distance function. For the derivation and other implementation details, please refer to the source material. It will be useful as I’ll explain the differences in the implementation I did for Helix. In this case, the occlusion should be total, but the dot product with the normal would result in the wrong angle. This is actually a limitation of working in screen-space, where marching in 2D does not match a marching in 3D due to overlap. What we need to do is test the angle with the tangent: if , we simply do not have proper data in the direction we’re interested in: it could be completely occluded, or not at all. Personally, I find picking “half-occluded” works best in this case. 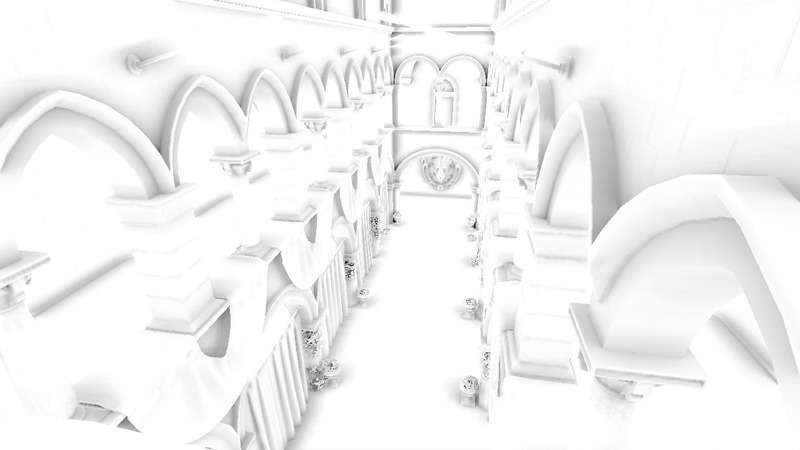 As with SSAO, to reduce banding artefacts, the orientations of all the sample directions should be rotated randomly per pixel. Helix’s approach takes one similar to Crytek’s original SSAO algorithm, using a 4×4 ‘dither’ texture containing the 2D rotation factors which is indexed so that it becomes tiled 1:1 over the screen. To assure an even distribution, rather than going for random angles, I instead used 16 evenly spaced angles between 0 and with being the amount of raymarching directions. Furthermore, the dither texture also contains a jitter factor, which we’ll use to offset the starting position to reduce banding artefacts. This is similar to the original, with some nuances to play nice with the way view space positions are reconstructed in Helix. 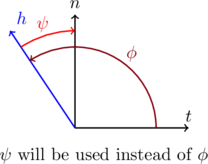 As per Louis Bavoil’s suggestion, introducing an extra sample closer to the center of the kernel creates more interesting contact occlusions. In my approach, both are combined by jittering the ray’s start position between the closest neighbour and the first sample size. Using dithering obviously introduces a lot of noise. Performing a depth-dependent 4×4 box blur afterwards will remove this while making sure every pixel always has contributions from the same sample directions. Some implementations rotate the directions entirely randomly (non-tiled) and blur heavily, but I feel this tends to create what I can only describe as “static AO clouding”: you can see a static AO pattern moving along with the camera. Other implementations like to combine 4×4 dithering and heavy blurring, but personally I like to retain some of the higher frequency occlusions. 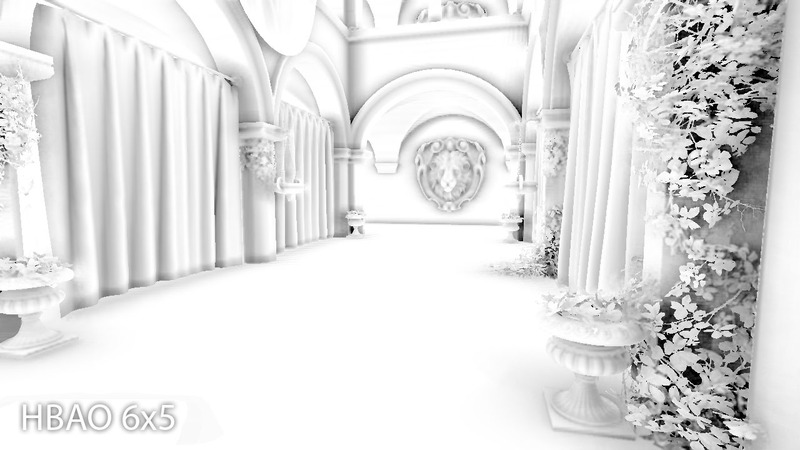 Regarding the normals, the source recommends using face normals which can be derived from the depth buffer. However, I simply use the per-pixel normals that are stored in the deferred renderer’s normal buffer. 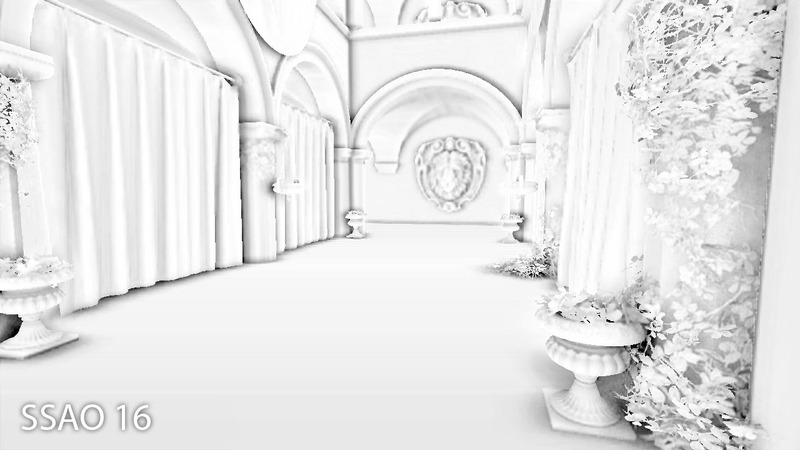 While this can introduce artefacts, the use of a bias angle largely cancels them out while still adding some normal-based occlusion. Below, you can see a comparison between this HBAO approach and traditional SSAO using similar settings and sample count. Notice how there’s less over-occlusion, especially near discontinuities (for example between the curtain and floor) while some details are handled more correctly (such as the creases in the curtain to the right). Even with a relatively small amount of samples, the improvements are remarkable. I did boost the parameters on both, violating my own rules, but purely for illustrational purposes! I guess no one will be happy without some sample code. 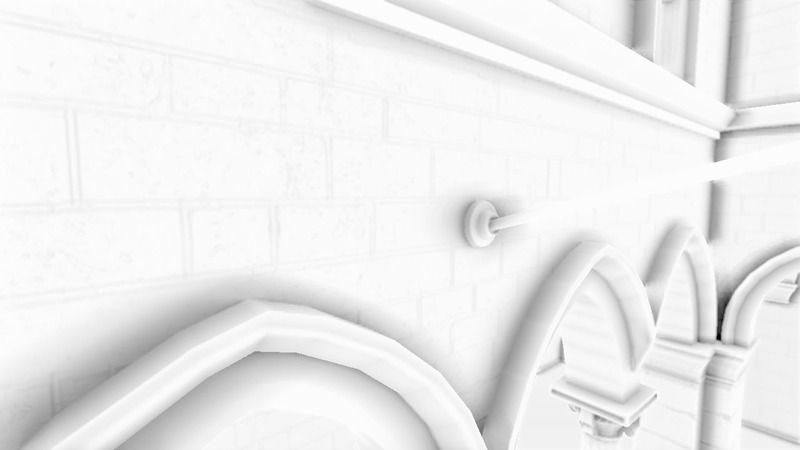 I can’t publish the entire Helix code (mainly because it’s a pretty inefficient mess right now) but I can show the shaders for the ambient occlusion step. The rest (blur shaders, etc) are default fare. All code is in HLSL Shader Model 5 for DirectX 11. And that’s it! I hope this post was useful looking into different AO techniques. Any questions, comments, corrections, … are more than welcome! 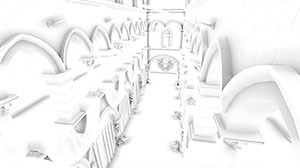 How to implement ambient occlusion in away3d ? Agreed with Serhio, do you think that anything like HBAO could be implemented on Away3D 4.X ?